If you had one vote for Vermont’s “Band of the Decade,” who would you choose? It’s a silly question, maybe, given that no such award exists — and that there’s really no “right” answer. Nonetheless, it’s a fun hypothetical, especially as we prepare to close the book on 2009 and, of course, the oughts. Certainly, the likes of Phish and Grace Potter and the Nocturnals would garner healthy tallies. And with good reason. But my vote could — and likely would — go to any among a number of smaller, less widely known acts. 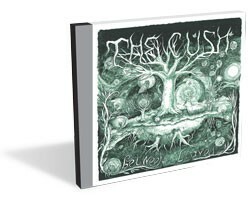 Though I won’t commit to any one in particular here, I can say that along with artists such as The Smittens, Ryan Power, Swale and handful of others who have similarly helped to define this era of local rock, Burlington’s The Cush would be in the conversation. That’s not to say the duo is lacking for new ideas. Rather, with this latest work, husband and wife songwriters Burette and Gabrielle Douglas have sharpened their dreamy, at times unwieldy, wash of narcotic psychedelia into a refined and elegant cacophony. From opening track “Telepathic Headdress,” which over seven harrowing minutes builds from a meandering, bloodshot crawl into a whorl of ringing organ and fuzzed-out guitar, to the bracing bliss pop of “The Vigilant Ones” and through the album’s weary benediction “Denver,” The Cush have made the defining record of a career that to this point has been difficult to define. While their trademark “ear candy” is firmly on display — this time around aided by Ben Maddox (Farm) on Wurlitzer and organ and Matt Hayes (ex-Chuch) on pedal steel — it’s the Douglases’ vocal performances that truly stand out, particularly when they sing together. Even more than on earlier efforts, the pair’s attention to melody is striking, the sonic swarms augmenting their songwriting. From start to finish, the album is a tour de force. In his review of The Cush’s 2005 album, New Appreciation for Sunshine, former 7D music editor Ethan Covey advised us to enjoy ’em while we had ’em because, he suggested, “This band is destined for bigger things.” It’s safe to say we have enjoyed them, even if Covey’s prediction has yet to come true. But that advice bears mentioning again, because Between the Leaves just might be the album that finally proves his words prophetic. The Cush celebrate the release of Between the Leaves this Friday, December 4, at The Monkey House with Nose Bleed Island and Tapis Bleu.